COLUMBUS, Miss. (AP) - In 1966, Columbus college freshman Diane Hardy enrolled at Mississippi State College for Women, along with her two friends Barbara Turner Bankhead and Laverne Greene Leech. They were the first black students to ever do so. 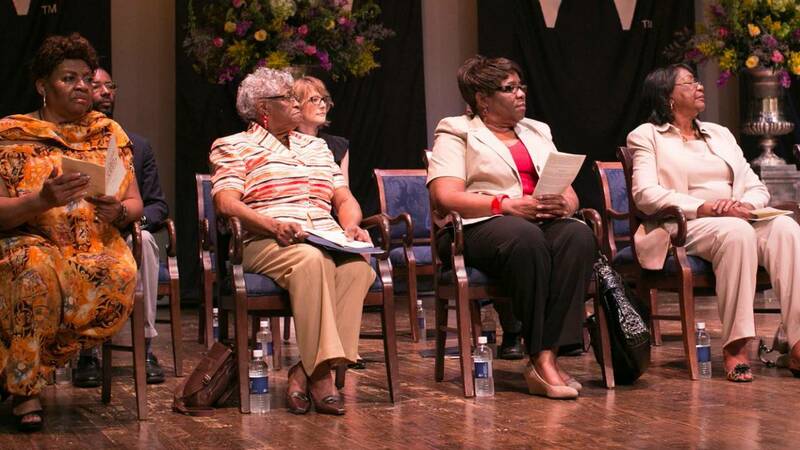 Fifty years later, Bankhead and Leech returned to the university -- now Mississippi University for Women -- where president Jim Borsig presented them with the university's Medal of Excellence. The ceremony was in Rent Auditorium on MUW's campus Thursday in honor of the 50th anniversary of the university integrating. Borsig gave medals to Bankhead, Leech, Jacqueline Edwards and Eula M. Houser. Edwards and Houser were both teachers at R.E. Hunt, the segregated high school in Columbus, who enrolled at MUW as graduate students in 1966. MUW awarded the Medal of Honor posthumously to Diane Hardy. MUW was unable to locate Mary Flowers, the sixth black student to enroll in 1966, but said when she or her family was located, the university would present her with a Medal of Excellence as well. "It was a wonderful experience," Jacqueline Edwards, one of the other recipients, said of receiving the medal. "I was very proud." Bankhead said she wasn't sure how she felt about receiving the medal. As she sat on the stage looking out over filled-to-capacity auditorium, she kept thinking how she had been sitting in the same auditorium when she learned Martin Luther King Jr. had been killed. "And this place felt much bigger," she said. "And people stood up and cheered and it frightened me. So I was thinking about all those things and all those memories came rushing back." Civil Rights activist Leslie Burl McLemore spoke at the ceremony, asking the audience to remember where they were in 1966. "Some of you maybe weren't around yet," he said. He wanted to put Mississippi 1966 into context, he said. Four years earlier, James Meredith had been the first black student at the University of Mississippi. In 1964, Freedom Summer arrived with university students from all over the nation who came to register African Americans to vote and push for Civil Rights legislation. It was the same year three university students were murdered by the Ku Klux Klan in Philadelphia, Mississippi, and the same year McLemore's personal hero Fannie Lou Hamer gave a testimony on live television telling Americans what it was like to be black in Mississippi. These things all captured the country's attention, McLemore said. But the entrance of six black students -- who McLemore termed the "fabulous six" -- to MUW did not capture the nation's attention. "The fabulous six brought blackness to (MUW) in 1966, although they brought it very quietly," he said. "It was not the red carpet welcome, but some of them stayed. And we are here today because we are celebrating the achievements of the fabulous six." It had been Hardy's idea to apply to MUW, just down the road from where she grew up in Columbus. She said she wanted to "see their reaction" at getting a letter from "a colored girl," she told MUW students in 2011. Bankhead and Leech, her friends at Hunt, wouldn't let her apply alone. During Thursday's ceremony, Leech described the day they registered in Rent Auditorium. "We walked through those doors, 17-year-old freshmen," she said. "Very easy to see us with the rest of the students. ...We were quiet. It was very quiet. As quiet as it is now. But we registered. We enrolled. We had just graduated from Hunt High School, and our senior motto was `We have crossed the bay. The ocean is before us.' Little did we know what the ocean was. But we decided to try and cross it." They ran into trouble almost immediately. During their freshman year on a trip to Batesville, she said what looked like Klan members sabotaged and encircled the integrated vehicle they were in, accusing the riders of being "outside agitators." "We were sitting there and I made my friends promise that if anyone approached us that we're not going to sit there and cry, that we're going to fight back," Bankhead said. "And they promised and Diane cried through it," she added chuckling. "But she said OK."
Bankhead said she had always been ready and willing to fight for what she believed in and for other people. "I would fight for anyone who needs help," she said. "In fact, I came here thinking I could be helpful. I remember that's what I thought, that ... there was somebody who needed to know something, someone who needed us. And Diane said let's try, so we did." Bankhead remembered having to take the physical exam to attend the university. "Do you know how separated it was when we first started?" she asked. "Even when I went for the physical. They called my name. They put my mother and (me) in the storage room in the dark because they didn't want me in their waiting room. My mother held me because I was ready to fight my way out of there, too." It wasn't all bad, she said. The Catholic students at the university were helpful, and the three freshmen attended church with them. Both she and Leech said they wished Hardy could have been at the ceremony. "We had quite some experiences here," Leech said at the end of the ceremony. "Some we chose to forget, but after years, we brought them back. And I'm happy to stand here today and tell you that I feel grateful just to look out here and see the diversity that was not here in 1966. I feel honored if I played any part in making a difference. We didn't come here to make a difference. We didn't come here because anybody encouraged us to. It was just because we were three little girls who wanted an education." Photo: Mississippi University for Women Facebook page (www.facebook.com/MUWedu). Click HERE for original photo.